Maja Wronska is a polish artist and civil engineer. I would imagine you would need to be a civil engineer or architect to draw something as perfect as this. It reminds me of an eerie trip I once took. I was living in Rouen at the time but took the train to Berlin and on the way stopped in Cologne. My vision at the time was a bit blurred and Cologne seemed bare (nothing old was left except the Cathedral) but the Cathedral was the most stunning place ever, and even more so with a slightly blurry perspective of it almost as if I were visiting a heavenly cathedral in afterlife. Later I saw WWII photos of the allies bombing over Cologne, decimating almost everything but the Cathedral, which they mercifully avoided. This entry was posted in art, World War II and tagged architecture, art, cathedral, cologne, drawing, Maja Wronska, Polska, Rouen, World War II. Bookmark the permalink. Thank you for telling us that the artist was also an engineer. What a powerful combination when it works! The training of engineering candidates is based on principles of science, fixed accepted truths so difficult to even bend, let alone break. 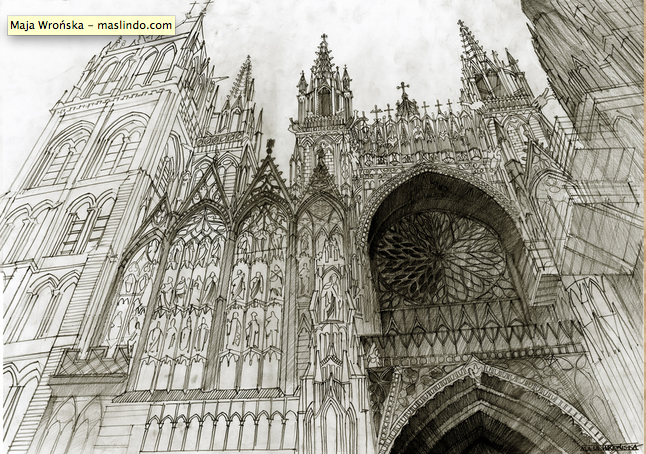 Here the artist made the cathedral come to us as spiritually impressive architecture with black and white. We have to overlook failures in depictions of stained glass with the limiting medium used.